[REPLAY] Aries Escape - Episode No. 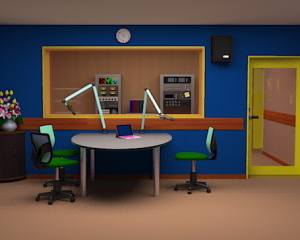 016: Radio Stations Escape is another new point and click type room escape game. In this game, you try to escape the room by finding items and solving puzzles. There are two possible endings. Good luck and have fun! It is not loading, just going to a page with all the other games in this series and when you click on it, it reverts to that page :( I am using Safari. No kidding. Game started to load then just disappeared. Chrome here, same result. I recall having the same problem with this site before. Can't remember what I did, though. looking for a clue for the pink box with 5 horizontal color bars. Ah, there's a water bottle by the bottom of the chair. Can't login to the laptop now. How'd you get into the cabinet under the flowers? It won't let me click on it. Help with pins box and "Parts B" ? The phone comes from the person next to your inventory. josh, I think you may have to open the door first. I'm not sure at what point the poster gets lit up so you can get the key, but I think once you have the key you can click there. All I have is the water and Parts A. Thoughts? Oh, I got it! There was a tablet on top of the chest of drawers. but what is the clue to the box on the cabinet of the flowers? I got the telescope together and saw the security code but it doesnt work on the computer. Any hints? There's nothing on the laptop. All I have is Parts B and nothing to do except the laptop code and the door. Josh, I'm confused about where you are. What do you need to open? Got the initial but now I need the 3 letter 4 number code. Oh, need 5 number code for the purple box with image of pin. Finally got the second end. Look at the computer again and search for dates. Acmer. Look at the big pot of flowers and count them according to colors. where do i use the security code please? maybe i should ask where to find key to the door first... anyone, WT please??? Take the phone from the figure's pocket to get it in your inventory. Click the desk, take the glass. Chair: take the bottle. Laptop: you need a login and a USB (side view. There are a number of right arrows to show side views, watch for them.) Microphone: take switch(1). Right (soundroom view). 6 digit code in 3 colors on the machine on the left. Security code that you can't yet see on the machine on the right. Dirty spot on the speaker. Flowers on the corner stand. Take switch (2) here. And of course the exit door. Right (android view). Note sticker with MHz channel, thermostat that needs SD. Android hanging on wall with left & right views. On shelf: yellow box with switches. Take towel and key D from blue drawers. Take coin from under books. Need 2 keys for toolbox. Use coin on the android and get a magnet and key C.
Right (calendar view). Note all the dates and symbols. Corkboard: pink note "On Air", 5 colored pins and a flower note, switch embedded in corkboard. Look under the note for toolbox key B. File drawer: use the up arrow to see the top and take a tablet. Note top drawer needs a SD to open. Open 2nd drawer with key D. Solve box inside combining colored pins and number of flowers on the corner stand and get telescope part A. 3rd drawer key C: cannot solve green box yet. Bottom drawer with magnet, solve with calendar symbols to get switch (3). Right (Window view). Open the blue box with the MHz for the coveted SD. Use your water bottle & wet the towel and put water in the glass. Put the tablet in the glass and put the glass on the windowsill for the code the pink box in file drawer 3. Left back to the file drawer. Open the pink box for telescope part B & assemble it with part A. Open 1st drawer with the SD and enter the 6 digit, 3 color code from the soundroom view for switch(4). Go back to the soundroom view and clean the speaker with your towel. Take a picture of the QR code with your phone. Android view: open the thermostat to get a toolbox key (A). Open the toolbox for pliers. Calendar view: Use pliers on the corkboard for switch (5). Soundroom view: Use telescope to get the security code. Laptop: put in the USB. Pink note (corkboard) for the login. Enter the security code. You've unlocked the door! You can go out directly for ending 1. For ending 2: look at the poster in the Android view. Take a key. Use it on the cabinet under the flowers. To solve this box go back to the laptop and check out "Favorites." Combine with calendar symbols. Open box for a special sticker, and leave for coffee and donuts. Superb, a not-too-verbose walkthrough as I love them. Thanks for making it, Andrea! BTW I reckon this was one of the easier Aries ones...made it to the notebook without any help (but with some trial-and-error here and there) but then stuck at the "security code". Thanks uzi, arby. I thought this one was one of their easier ones too. Extremely logical and zero confusion about which code goes where. @arby, I used to be IT. I would cringe, then get the axes and start screaming at people if someone put a login name on a post-it like that. Which is probably why I never considered it as a login until it was the only clue I had left. Christmas season came aerly this year? Hint: passwords don't have spaces in them. Well... after Neutral's Elements I find it hard to think of any other new games as a 5-star one - but that would be unfair... and this game was immaculate, a genuine Aries game - so why on earth would I spare any stars here? I can't finish this one, the green box with 3->8 uses special characters that show up as boxes for me. So no go. Very good game, logical, entertaining and not hard, thought I can complete it easily myself, but had to come here because couldn't find the phone which I decided was necessary for the image on the speaker. Well, the location of the phone was really mean! For 3-8 box, if you can't see the symbols, use the walkthrough and count the number of clicks. Wonderful game, Aries! Can't wait for the next one.